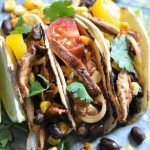 Healthy Black Bean Taco Burgers! 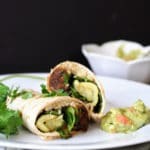 They’re vegan (duh), gluten-free, won’t fall apart on the grill (yay), and so very delicious! How do you get your protein? If I had a dollar for every time I’ve heard that question when people discover that I’m vegan….. It’s a legit question. Most people don’t know, and I’m not flustered by it any more, I’m actually happy to answer any curiosity that non-vegans have about my plant-based lifestyle. 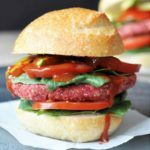 So, for all of you who are new to this plant powered world, and to our sweet little blog, let me introduce you to this protein bomb of a burger. I like to call it, the Taco Burger, because it’s stuffed with the veggies and spices that I’d put in a tortilla. Clever. Mexican food is a go to for my family. We eat some form of it at least three days a week. Because of the frequency of our culinary craving for all things spicy, I have to get creative so life doesn’t become mundane. You know what I mean. That’s where this recipe inspiration came from. I was all set to make black bean and veggie tacos, but alas, I didn’t have any tortillas. However, I did have hamburger buns leftover from this delicious burger. My lazy beaten up (Alex and I ran 20 miles and my legs were tired) self didn’t want to take my compression socks off and go to the supermarket, so I had to get creative. My mind was saying, Give Me Tacos! My body was saying, Do NOT Walk More Than Three Feet From the Kitchen! Before I knew it, I was creating a burger out of the taco ingredients. The rest is history. And…..back to the protein part of this story. 😉 I ramble. Sorry. After running 20 miles (we’re nearing the end of our Chicago Marathon training), my body was screaming for protein. It needed something substantial and satisfying. This black bean veggie burger didn’t disappoint. Black bean burgers are the best. They’re so easy to make, they’re hearty, and they’re good for you. What else could you ask for? Well…. You could ask for them to be filled with spicy Mexican flavor. To have added protein and texture from sweet corn, red bell pepper, onion, and jalapeno peppers. You could also ask that they NOT fall apart on the grill. Finally, you could ask that they not turn to mush in your mouth, and that they have a little bit of a bite to them. These are all that. Are you ready to learn how to make one? First – Rinse the beans (RESERVE THE JUICE) and grind a few cups of rolled oats into flour. Second – Toast the spices to release their flavors and sauté the onion, peppers, corn, and garlic. Third – Put part of the beans, oat flour, bean juice, and spices in a food processor and pulse until it forms a sticky solid ball. Fourth – Scrape the bean mixture into a large bowl and add the remaining beans and the veggies and mix together until fully combined. I use my hands for best results. 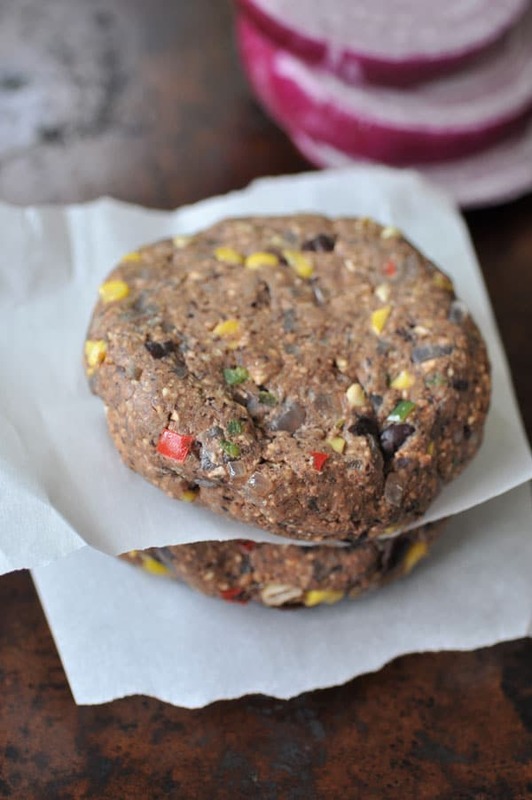 Last – Form into round patties and refrigerate for at least an hour. This helps them set and stick together for the grill. Once they’ve set, fire up the grill or a skillet and cook until they’re done. Serve them with shredded lettuce, tomato slices, grilled red onion, and guacamole. If you don’t want to eat them with a bun, wrap them in a crispy lettuce leaf or just eat them with a fork. 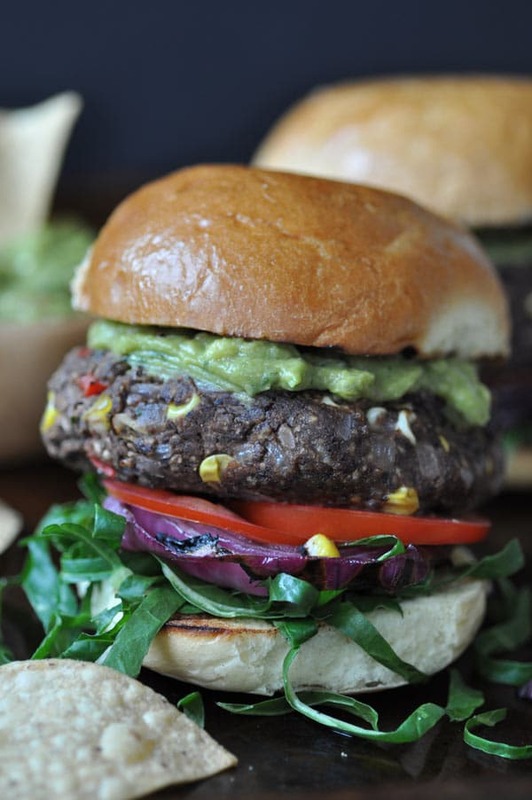 How amazing does this healthy black bean burger look? I made a second batch of them and took them to my BFF’s 30th anniversary party last weekend, and they were a hit. It’s hard not to like a burger that’s spiced up with toasted chili powder, cumin, and chipotle chili powder. Make a batch of these beauties and then come back and let me know what you think. If you like them, tell your friends about them. 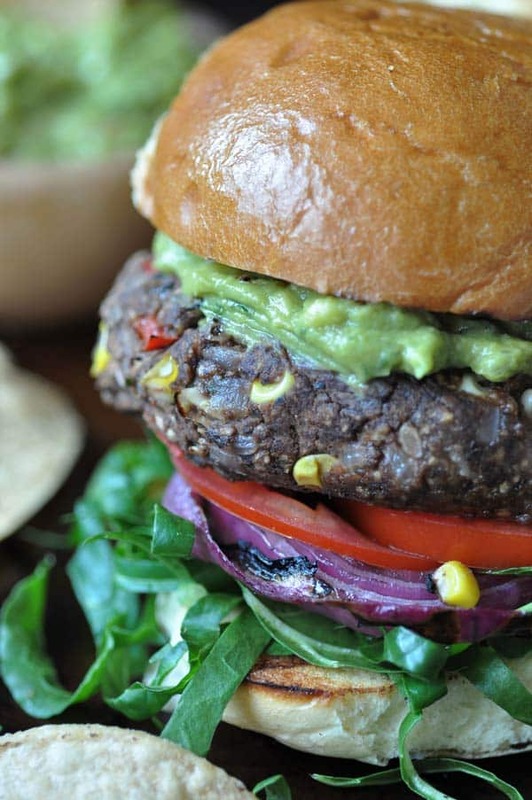 A healthy and easy vegan and gluten-free black bean burger that's filled with Mexican flavors! Avocado oil to brush on top before cooking. Drain (reserve the bean juice) and rinse the beans and set aside. In a small pan, toast (stir or shake the pan frequently to avoid scorching) the chili powder, cumin, and chipotle chili powder on medium-high heat until they release their oils and become fragrant, approximately 2 minutes. Remove from heat. Grind the oats in a food processor. Use rolled oats only, not steel cut or instant. Make sure they’re certified gluten-free if you are avoiding gluten. Add 1 ½ cups (255 g) of the beans, the bean juice, and the toasted spices to the food processor and grind until it forms a solid sticky ball. Approximately 1 minute. 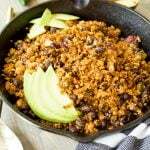 Heat a large cast-iron skillet or a non-stick skillet on medium-high heat and add the chopped onion, peppers, and corn. Cook for approximately 8 to 10 minutes, or until the onion and peppers soften. Stir frequently to avoid scorching. Add the garlic and cook for 2 minutes. Remove from the heat. Scrape the bean mixture into a large bowl and add the remaining ½ cup (85 g) of solid beans and the corn and peppers (make sure they’re cool to the touch) and stir to combine. I use my hands to really get in there and make sure that the mixture is completely combined. Scoop out a heaping 1/3 cup (73 g) of the mixture and roll into a ball, then press into a patty. Repeat with the remaining bean mixture. (You should get between 8 to 10 patties with 1/3 cup (73 g). If you want larger or smaller patties, the amount will vary.) Refrigerate for at least an hour to allow the patties to set. This will help the burgers to stay together during the cooking process. 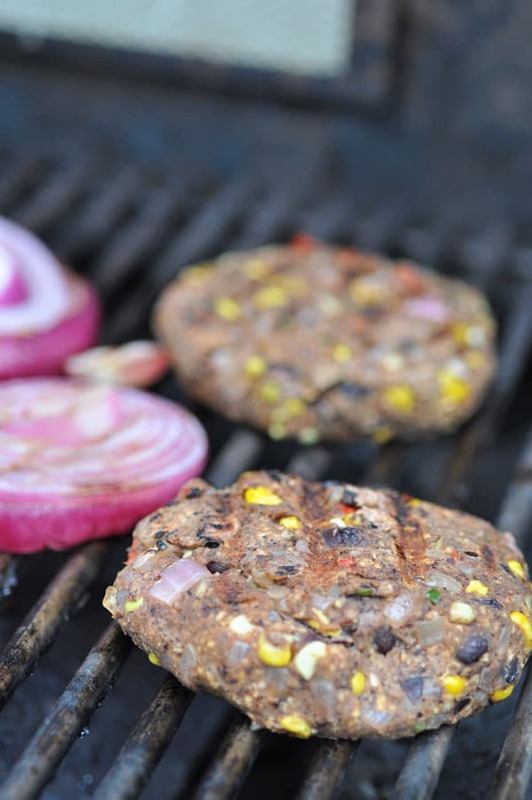 Once the patties are set, heat a grill or a pan on medium heat. SEE NOTE. 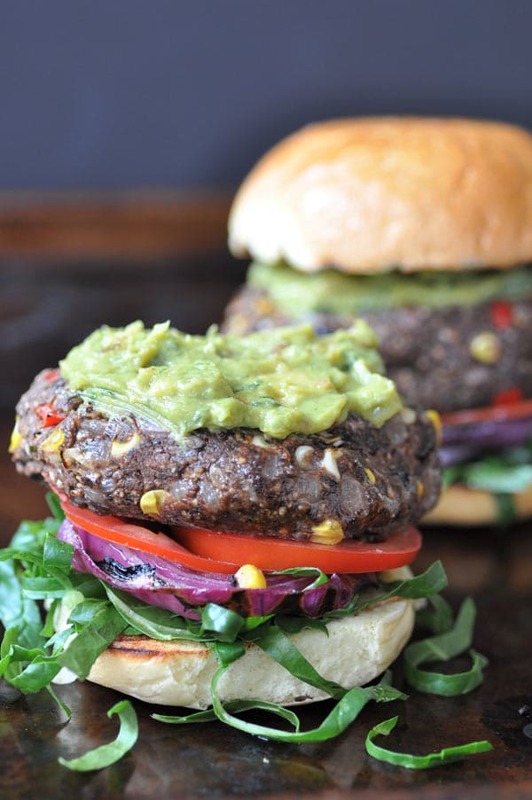 Lightly brush both sides of the burgers with avocado or another type of oil that tolerates high heat. (This will prevent sticking to the grill.) Cook for approximately 5 minutes per side, or until they are lightly browned and heated through. NOTE: If you want grilled onions on the burger (I highly recommend that you do), slice them into 1/3 (.84 cm) to ½ inch (1.3 cm) slices, brush with oil, and grill until they soften and the edges are browned. Top with grilled onions, shredded lettuce, tomato slices, and guacamole. If you want to skip the bun, wrap it in a lettuce leaf instead of shredding the lettuce, or just eat it with a fork. If you want grilled onions on the burger (I highly recommend that you do), slice them into 1/3 (.84 cm) to ½ inch (1.3 cm) slices, brush with oil, and grill until they soften and the edges are browned. This is so perfect for those nights when I can't decide between tacos and burgers! And I love that they won't fall apart when you cook them. Exactly! They satisfy both cravings. Thanks, Dianne! Oh yes, LOVE taco flavors in a burger! These look so good!! Taco burgers!? What a great idea and you have packed so many flavours in there. They look awesome! Haha on the protein question, I got that from someone at the gym the other day. Exciting on the marathon coming up! And this recipe looks perfect, love the fusion of flavors. Thanks! That is THE question, right? :) Thanks so much, Alex and I have our 22 mile run on Monday and then it's taper time. Yum! Who doesn't love burgers? 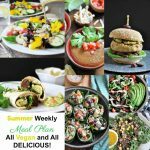 I love this recipe especially because it shows how everything can be made healthy! Thanks, Linda! I love the idea of a taco burger. All those Mexican flavors are so yummy and you put them into one delicious burger. I can't wait to give it a try. Thanks for this, Linda! Everything to love about a taco in a burger, which everyone loves too! 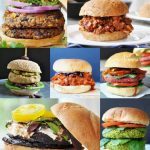 I have been looking for the perfect homemade black bean burger recipe and this looks like it may be it! Thank you, Kate! Let me know how you like it. Wow! Those burgers look incredible!! Mexican is our go-to as well so I'm excited to see this taco burger! Burgers are always a win in my house. And combine that with taco flavor? The best! Ease of use suggestion (and request): it would be great to print 2 pages rather than 3. That way printed recipes fit into one protective sleeve.